Hey, y’all — guess what ends this weekend? Hurry! One doesn’t really need an excuse to post a bunch of photos of the Great State Fair of Texas, but it IS the closing weekend, so why not enjoy a few images from the past few decades. 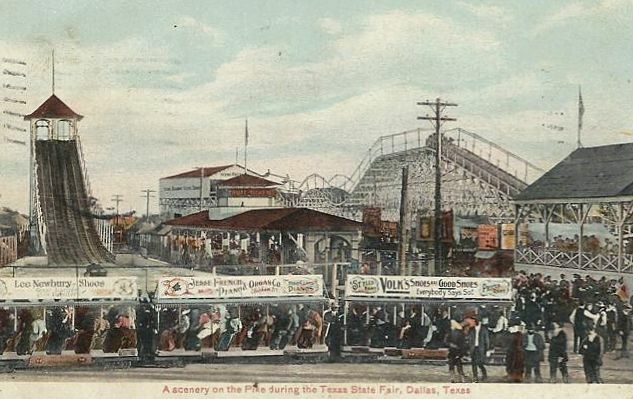 Above, a view of the Midway in 1909 (then called “The Pike”), with the Log Ride-like “Chute” and its ramp, a roller coaster, and a loaded tram festooned with shoe ads (including one for Volk’s). Two women enjoying ice cream in 1930 — State Fair food has always been one of the main joys of visiting the fair. Ad from 1946: “So sorry, Bill, but Albert is taking me to the State Fair of Texas.” The grown-up entertainment that year was provided by Tommy Dorsey, Gypsy Rose Lee, and Jackie Gleason. 1958 photo featuring the monorail by Squire Haskins, from a Dallas Morning News online article featuring TONS of cool photos of the fair over the years, here. Big Tex photo (undated) from the Dolph Briscoe Center for American History. Another post of random images of the SFOT through the decades — “The Fair Is In the Air — Let’s Go!” — is here. Another great bunch of photos and memories too. Thanks.